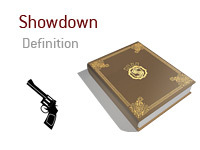 A showdown is a decisive confrontation, and the word often conjures images of high-noon gunfights in the Old West. That makes the term 'showdown' appropriate thematically and by definition to poker and other card games. In poker, the showdown situation occurs when the table has completed all betting and two or more players remain. During the showdown, each remaining player must reveal his hand, in the order of the deal, if need be. In practice, showdowns tend to occur simultaneously, and standard poker etiquette requires players with probable winners to show quickly. Likewise, etiquette calls for any player involved in a side bet to show quickly as well. This revealing of the cards, or showdown, concludes the hand by determining a winner or, in some poker variants, winners for that hand. A showdown does not occur if only one player remains. That player is simply the winner. The reason for this is that the poker rules do not require a winner to reveal his hand after the fact. Likewise, a player who has folded prior to the conclusion of the round has no obligation to reveal his hand or any other information. On the flipside, in order to win a pot when more than one player remains, a player must place all of his card face-up on the table. By all, the rules mean all cards, including those that the player did not actually use to win the hand. If during a showdown a player realizes his hand has lost, he has the option of mucking it rather than revealing it. Since losing hands reveal much information beyond the cards themselves, many players choose to muck. However, any player dealt in has the right to ask to see any cards involved in a showdown, even mucked cards. This right is reserved for uncovering collusion and other cheating, and players cannot abuse this just to see the cards.